By keeping track of current market developments, we are offering an exclusive range of Retaining Adhesives. Our skilled professionals process the offered adhesives utilizing quality approved chemical compounds and high-end technology. The offered adhesives are processed to create retaining that increase the shear strength of cylindrical metal assembly. Apart from this, our quality controllers keep an eye on the entire range at every stage of production to eliminate any kind of flaw. Our offered products are well-known in the market for featuring variegated attributes like solvent and chemical resistant and high adhesive strength. 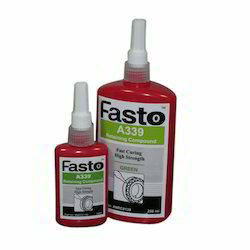 Fasto A339 is super high strength, high viscosity and super fast curing retaining compound for bonding cylindrical assemblies with clearance. Typical applications include retaining of locking sleeves, bearings, pulleys, sprockets, gears onto shafts. Retaining Compounds secure bearings, bushes and cylindrical parts into housings or onto shafts. They achieve maximum load transmission capability and uniform stress distribution and eliminate fretting corrosion. Applied as a liquid, they form a 100% contact between mating metal surfaces, eliminating the need for expensive replacement parts, time consuming machining or the use of mechanical methods. 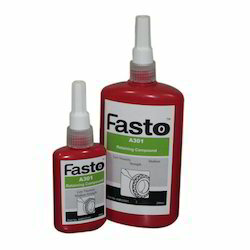 Fasto A301 is a single component, anaerobic retaining compound formulated to give a controlled medium strength bond. Typical applications include mounting bearing in place on shafts and in housings. The controlled medium strength allows disassembly for servicing and bearing re-use. A341 prevents corrosion of assembling parts. Fasto A320 is suitable for high strength and high temperature retaining compound. It applications that require large gap filling. Fasto A320 is designed to augment the strength of slip fit assemblies and for use on loose-fitting or worn parts, where larger gap fill is required. 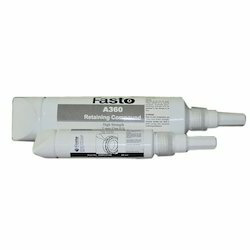 Fasto A360 is a one-component, solvent free, high strength and high viscous retaining compound. It is suitable for applications that require maximum gap filling. Typically recommended for the repair of blow holes and cracks on worn-out bearings, bushings and hub- shaft connections as well as metal threads.